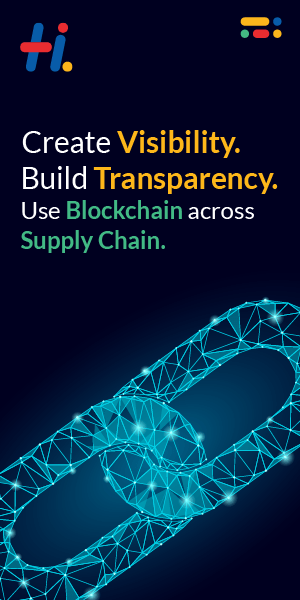 The idea of Vinchain started since February 2017 when the team of innovative people began to study the ability of blockchain to collect and store information. Our plan is to solve the problem of asymmetrical information in the used vehicle market by creating a decentralized transparent blockchain database that records all information about vehicles. Centralization of information is a huge problem nowadays. It’s easily changed for the own purpose of a person who is interested. There is no trust between buyer and seller due to the bad reputation in the past. Dealers lose money due to the falling price on the cars. Insurance, leasing companies and bank fall for fraud due to the inability to check the information. This problem is so important right now that many governments start to take action in attempt to solve it. In some states of the US there is a prohibition on selling a car without VIN history. It’s going to be on a federal level so the need in our reports will grow as well. Europe Parliament is going to call for the documentation of all odometer reading starting from 20 of May 2018 in order to prevent manipulations with odometers. The problem is real and the databases that exists can not cope with it so we need to come up with a better ideas. Our solution is to create decentralized blockchain database that will store all the information about vehicle. Provider will; be able to add information to the system and to get reward for that. The reward will be paid in VIN tokens and the size of it will depends on the importance of provided information. 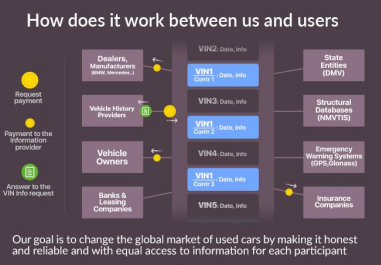 VIN tokens will be paid when the request on a particular data is made and they will be paid each time when the information is needed. One more technical aspect is that blockchain technology can not hold such amount of information that we are going to collect, so we decided that we are going to store the majority of information in centralized bases(such info as photos, texts, names), then create a hash on each of them and store that hash in a blockchain. After a client will make a request on a particular information he will receive it from the central bases and he will also receive a hash so he will be able to check that the information hasn’t been changed since the moment of adding it to this central base. As long as the amount of tokens is limited they will definitely grow in price and we believe that it will happen in the near future. With the growing demand on our reports the price of the tokens will grow as well. Also in the future we believe that our clients will be able to pay with our tokens for different services that we will have partnership with. So we are sure that our token will grow in demand and price with the time. This is the reason we are taking a small part of payment for reports and not trying to collect as much money as possible. We believe that our token will be perspective so we are aiming for the future development of it.